Call it high-tech parental spying, call it a great way to reassure kids who get anxious away from home. Either way, parents have one of the best reasons going to get involved with wearable tech; a GPS kids tracker lets you keep a virtual eye on your family when they're not in sight. Many of these trackers can even act like emergency mobile phones for parents not quite ready to let their kids deep-dive into the addictive worlds of smartphone social networking and gaming just yet too. We're going to look into the seven most important aspects you need to consider when looking for one of these GPS kid trackers from the ongoing costs to the kind of tracker your child will actually want to wear. A GPS tracker for kids can be a lot like a mobile phone in some core respects. Crucially, most fully featured devices need a SIM card. Now, this isn't the part that does the GPS tracking. There's a separate GPS chip for that, but without a SIM card or giving your child a smartphone, there's no reliable way for your child's location to be transmitted from the device to let you actually track it. Last year, Qualcomm announced the Snapdragon 1200, a low-energy chip with built-in LTE that's creates specifically for kids trackers. This would allow devices to be connected over longer distances and, as its a thin chip, would allow slimmer devices. GPS uses satellites in Earth's orbit to triangulate the position of one of these trackers. GPS devices, like running watches, are very accurate outdoors, but tend to struggle to work indoors so don't expect to be able to reliably track them from classroom to classroom as they amble through the school day. Some trackers are designed to be stashed in a rucksack, worn around the neck, or perhaps kept in a pocket, but there are also more gadgety designs. 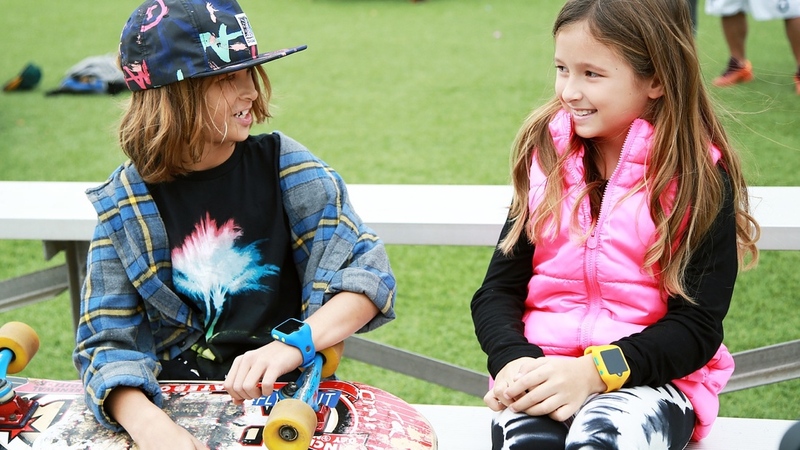 GPS tracking watches like the Watchu offer a kid-friendly take on an Apple Watch. The key is to work out what will get your child engaged. Will they like the idea of wearing a gadget on their wrist, or want to take it off at the first opportunity? As GPS kid trackers use mobile data to transmit the location of your child, there's some ongoing cost rather than just the original outlay for the watch/tracker, which tend to cost between $50 and $150. There are two main choices when paying for the service side of one of these trackers: pre-pay or a subscription. This is much like the split between "pay as you go" phones and ones on a contract. In the US, popular kids watches tend to be affordable up front with a low monthly fee e.g. HereO V2 is $199 then $4.95 a month subscription with no long term contract. You can also check what deals your network is offering. So if you're a Verizon customer you can get LG's Gizmo Gadget watch on a two year contract for $150 with no monthly fee for voice calling and messaging. You're likely to get a better deal if you effectively sign up for one of the 'contract' like deals by paying for a year of service. However, it's best to look into the specifics of any kid tracker so you don't get surprised by any extra costs. However, keep in mind that kids trackers in the US aren't as popular as they are in other parts of the world, especially China and Europe, so it may be a bit more difficult to find a deal. In the UK, the cute little blue tracking box Weenect costs £5.90 a month without any long-term commitment or £3.80 a month when signing up for a year (as a £45 one-off payment). This gets you unlimited location tracking and up to 10 minutes of calls a month. Similarly, Spotter is £3.95 a month or £35.95 a year. And the Aspis8 is £20 to purchase plus 12 payments of £10 a month for a minimum of one year. Rival kiddy smartwatch Watchu's service is more like an old-fashioned pay as you go phone. You top it up with credit to make sure it continues to work, and the estimate is that it will cost £1 a week if you use it for general use. Any calls from it will then cost 30p a minute, regardless of where you are in Europe. One of the most important considerations when looking for a tracker is whether you want to be able to call, or video-chat with, your child. Some trackers only have an SOS function, which contacts a pre-set list of contacts when, usually, they long-press a specific button. Trackers like the Watchu, Weeniest and Liberty GPS have built-in microphones and speakers to let them function just like a phone. Most kid trackers have this phone feature, usually letting the kid get your attention by pressing a button before letting you call them back. It tends to be trackers for adults that just have a SOS notification feature with no calls. Some trackers, like AngelSense, even include listen-in features that let you listen in on what your kids are doing. So if you're worried about where they are or why they're taking so long, you can listen in to make sure they're not talking to a dangerous stranger. Doki, a wrist-worn kid tracker, even allows video chat. It has a 2-megapixel camera above the screen for the purpose. However, as this will naturally use a lot more data than quick location pings, you have to supply your own nanoSIM for Doki. You can get hold of one from a phone network, with a "SIM-only" deal. Now we've got through some of the basics of how a kid tracker operates, it's time to find out the kind your child might actually like. Should it be a toy, or something not exactly fun, but that they know they can use if they get in trouble? The Weenect is a great example of the more basic kind of tracker. It's a blue box with a big red button and a little handle, letting you strap it to a rucksack. They don't have to worry about it, it shouldn't get in the way. Watchu, Aspis8, HereO and the Gator are completely different. They have the same sort of GPS tracking functions, but are watches that also give your child a way reason to want to wear them. Like a Fitbit Ace, they track their steps, adding a game-like aspect. It might motivate them to be a bit more active. Some kids smartwatches, like the Omate K3, even have games. That said, if your child has already been exposed to the wonders of mobile gaming through a tablet or smartphone, it's unlikely these games will hold their attention for too long. One thing to consider is that wrist-worn trackers are always on your kids persons. The non-worn trackers, on the other hand, have to be strapped or placed in a rucksack. It'll keep it out of the way, but if they lose their bad they also lose the tracker. The downside of a wrist-worn tracker like the screenless Tinitell becomes pretty obvious when you see them on a kid's arm. A watch like this needs a decent battery as GPS is quite power-draining. Most will seem very chunky, particularly on the wrists of younger kids. It all comes back to: will they really want to wear it? It may be much easier to get one of the non-worn models. How you actually monitor the location of your child is pretty consistent across all of these trackers. There's an app you install on your phone or tablet, which then displays their location. Some also have a web interface, letting you use any computer or connected device to look them up. Just looking at where your kid is every now and then isn't the most useful way to operate a tracker, though. One feature you want to look out for is geofencing. This is where you're given a notification when your child leaves a pre-specified area. The key use is fairly obvious, keeping an eye on them while at school. Or geofencing your home in case they try to sneak out. It also lets you know when they leave school and when they arrive home, so you won't have to nag them to let you know when they leave one place and arrive at another. SOS plus geofencing will likely be the perfect combo for many, but there are more advanced solutions too. AngelSense is designed specifically for kids with special needs, and could come in particularly useful if you're worried your child is being bullied, or if they are autistic and having a hard time at school. You can set up alerts if they don't leave school on time, there's a mode that relays their location at 10-second intervals and, as previously mentioned, you can use it to listen in to the AngelSense's mic without starting a phone call. You can hear what's going on around them. This is a real spy-style tracker. Some kids, particularly older ones, aren't going to like being lumbered with the thing. But it could be just what you need. The kind of tracking involved will have a big effect on how long the battery of one of these devices lasts. AngelSense lasts for 12-14 hours of tracking using standard 30-second update internals. That means charging every day, just like a smartphone. Watchu lasts 4-5 days off a charge, and the ultra-simple Pod Pro keeps going from 5 up to 20 days. That's when only requesting a location update every hour, though, which is probably not what you need with a kid who's going to go AWOL over a matter of minutes, not hours. The other practical consideration is how much abuse one of these trackers will be able to take. Models without screens are likely to wear better, if not for any other reason than that scratches and scrapes just won't matter as much. Most kiddy wearables out there either don't mention ruggedisation at all, or do so informally, saying it'll handle the rain but not swimming, for example. However, you'll also want to look out for any water/dust resistance certification based on the IP rating, which stands for ingress protection. It's displayed as "IP" followed by two numbers, the first telling you how impervious it is to dust and other solids, the other letting you know how water resistant it is. The higher the number, the better the resistance, and 6/7/8 gets you a very useful level of water-blocking, able to take on water jets or being flat-out submerged. If you're in more of a position to think about what type of kids tracker is best for your family, check out our big test of three kids wearables options as well as our best kids trackers round-up.